Most of our Christmas decorations have been packed away for another year, but a few things will stay out for a little longer. 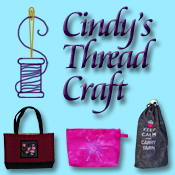 Back in July of 2010 I was working on a sampler quilt along and won a jellyroll in one of the drawings. 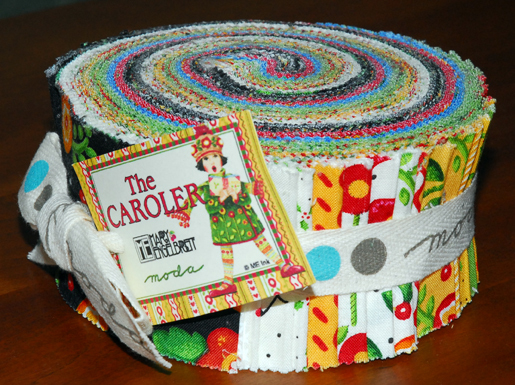 For those of you who are not quilters, a jellyroll is a set of fabric cut in 2 1/2 inch strips. The jellyroll I won was a Mary Englebreit Caroler jellyroll. It is an interesting group of fabric that you wouldn’t think of as Christmas themed at first glance. I looked around for a pattern to use that was designed for jellyrolls and decided to use the Gift Boxes pattern from Cozy Quilts. I added a couple of additional fabrics so I would have more white fabric in the quilt and I also added some red for the border. 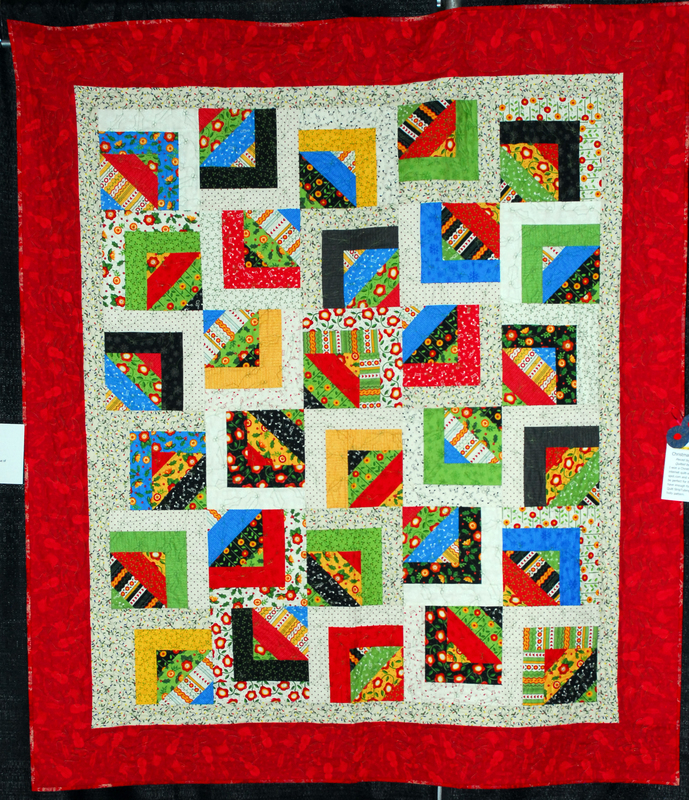 It is quilted with a green variegated thread in a meandering holly and berries pattern. I finished this quilt in May of 2011 and showed it in the Genesee Valley Quilt Club (GVQC) show in June. There were a few bits left over so I made a set of pillow covers for our sectional. I always make my pillow covers with zippers in the back so I can change them depending on the season. Since this fabric doesn’t scream Christmas we plan on keeping them out at least until spring. I use the quilt to keep warm while watching television. Here is a picture of the pillows and quilt and also the other quilt I want to tell you about. 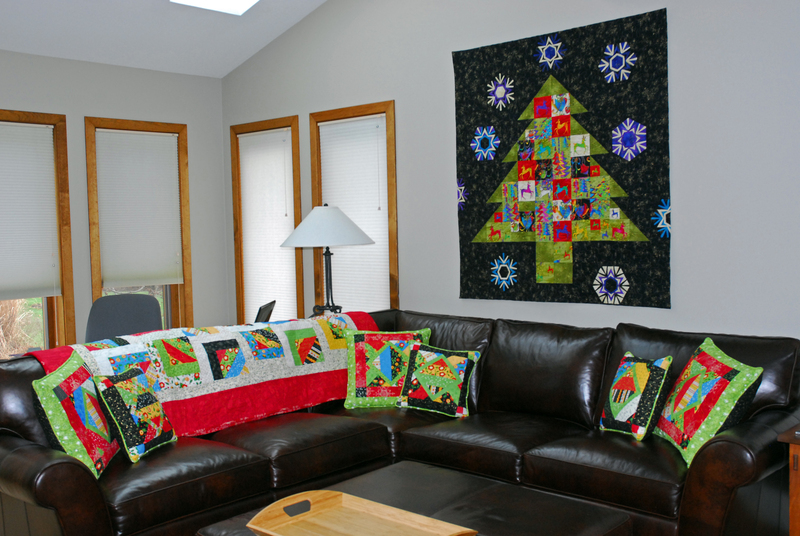 The wall hanging above the sectional is also a new quilt. I finished around Thanksgiving so we could put it up for this season. I plan on swapping it with the Autumn Leaves quilt I made that is now hanging in our hallway up stairs. This quilt is the first original design I have created. It was inspired by the fabric which is from the Laurel Burch Holiday Celebrations line. Charlie and I saw it at Patricia’s Fabric House during their August quilt show (when they also have a great sale) and he kept saying, ” I love that fabric…you should make something with that.” I hung around to view the show for a while and he went home. Before I left I picked up about a yard of each of the fabrics and some additional of the black. I based the design on 4″ squares (finished) and planned it out on graph paper first. Then I started fussy cutting and pinning things to my design wall until I had the look I wanted. The pattern for snowflakes is from the book Paper Piece the Quick-Strip Way by Peggy Martin. She was one of the speakers and taught a workshop I attended for the GVQC this fall. I had to scale them down a bit to fit within my 4″ x 4″ scheme. With fill pieces to make them square they measured 8″ x 8″ when finished. I had to draw out another map to figure out how to piece this all together. Mainly I pieced together rectangle sections and then pieced those together to make a strip that went from top to bottom. I quilted the tree with a matching green embroidery thread on the front and back and used a gold embroidery thread on the black background. If you click on the image you might be able to see the quilt motifs I used. 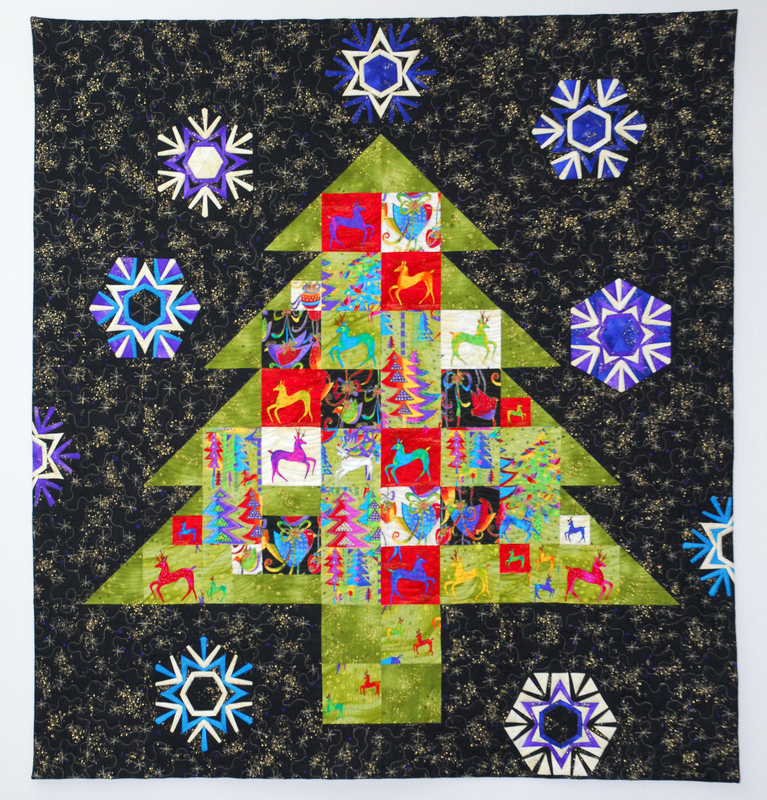 I did a stitch in the ditch on all the seams on the snowflakes, a meandering snowflake like motif in the black background and over the tree it is like small connecting arcs. Kind of hard to describe, but maybe you can see in the bigger version. Since this quilt also doesn’t scream Christmas, but to me rather just winter I plan on keeping it up until March or whenever our snow stops falling. Thanks for stopping by my bloggie. Wow you are talented. How long did it take you to make the wall hanging quilt? I think you are right.. time for the autumn leaves one. Thanks for visiting our blog! We’ll add you to our Google Reader so we can “follow” you! Our mom is a big quilter, too, and we just love the ones in this post! Also thanks for linking to Cozy Quilts – Mom’s never surfed over to that shop before. They have all kinds of interesting things! Thanks, too, for the birthday wishes! You should sell copies of this pattern- it is simply gorgeous! Definitely want to make it myself! Your quilts are just beautiful. Mom has wished forever to be able to quilt. Maybe one of these days she will take some classes. We are really enjoying your work!